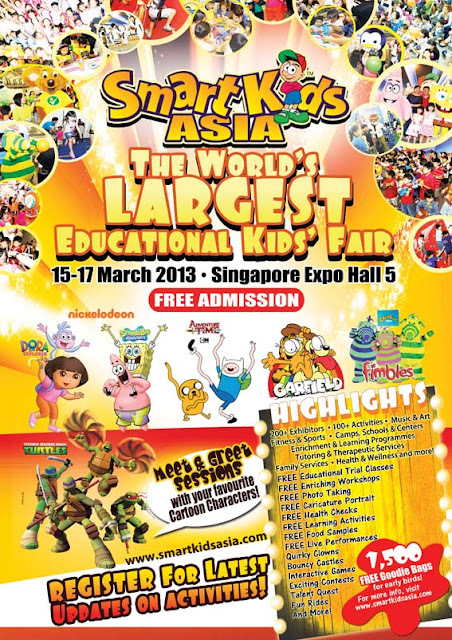 SmartKids Asia, the World's LARGEST Educational Kids' Fair is happening from 15th to 17th March 2013 at Singapore Expo Hall 5. The fair provides a platform for us explore things that are related to education, family & health, it may give us some ideas on the activities to help boost kid's academic development, suggest some outdoor activities or games for the family to do together. And since fairs are suppose to be FUN! Be sure to try out all the activities with your kids and don't forget to the Meet & Greet sessions with Dora the Explorer, Teenage Mutant Ninja Turtles, Spongebob Squarepants and more! Here in DinoFamily, we love to share great deals and today we are hosting a giveaway *YEAH* where 4 of our lucky readers will walk away with a SmartKids Asia 2013 goodie bag each! All you need to do is to answer this simple question by leaving a comment below. We will randomly pick the winner with the correct answer and contact you by email so do remember to include your name & email address, I will also need to gather more personal information for collection of the goodie bag. We will also announce the winner in this post and our facebook page. Note : Winner have to collect the goodie bag directly from SmartKids Asia's management office at the fair. The contest is open to Singapore only and will end on 04 March 2013 at 2359hrs. It is held at Singapore Expo Hall 5. Tks. It is at Singapore Expo HAll 5, from 15th to 17th March 2013. Hello, it would be held from the 15th-17th March at the SG expo hall 5. It will be held at Singapore Expo Hall 5 , from 15th to 17th March 2013. It will be held from 15th to 17th March 2013 at Singapore Expo Hall 5. It will be held at the Singapore Expo Hall 5 from 15-17 March 2013. It will be held at Singapore Expo Hall 5 between the 15-17 March! Can't wait to go, went to the one last year also at Expo and they had many booths that were very helpful in the education/fun learning/enrichment aspect for my kiddos! It will be held from 15-17 March 2013 at Singapore Expo Hall 5.